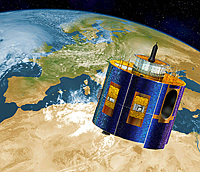 Everyday, Meteosat images of Europe acquired at 09.00 UTC are shown on the Interactive Meteosat online application. Students from participating schools can observe the weather and upload their meteorological observations to the application. The observations are then shown in real time as an overlay on the satellite image. When many schools participate and upload their information, the application shows the weather observations throughout Europe overlain on the daily Meteosat image, enabling a more detailed interpretation of it. With the aid of these observations, the Meteosat image, and other meteorological information, students can draw a weather map and predict the weather in their region and elsewhere. Note that in certain parts of Europe, 09.00 UTC corresponds to 10.00 CET during the winter, and to 11.00 CET during the summer (CET: Central European Time).